2019 is the year that reusable smoothie cups are going to come in to their own. 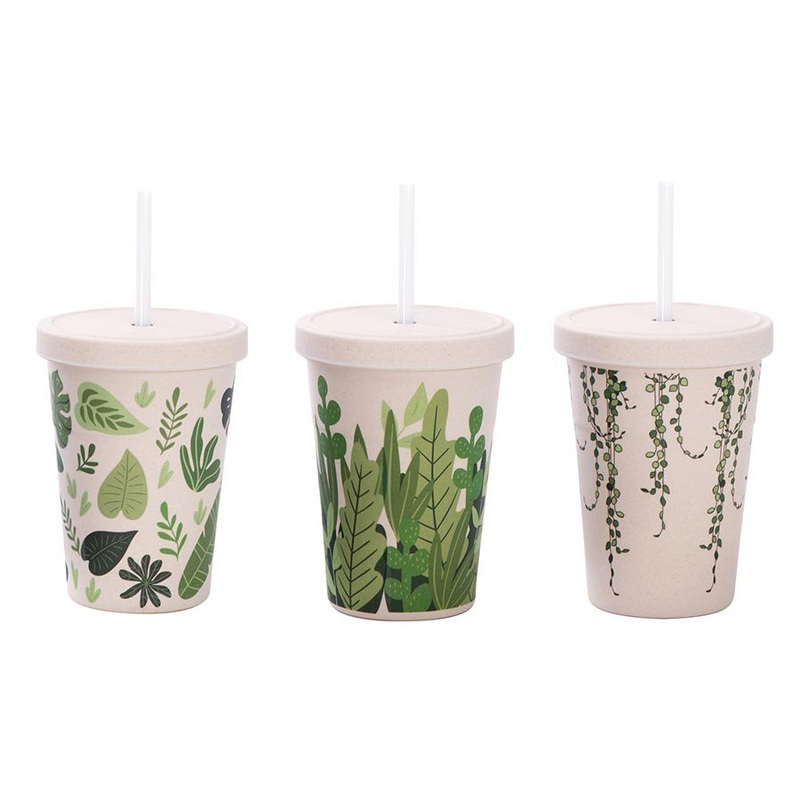 Just like reusable coffee cups a couple of years ago, attention is turning to the massive numbers of plastic lined paper cups, plastic lids and plastic straws that are being used just once and discarded every day. 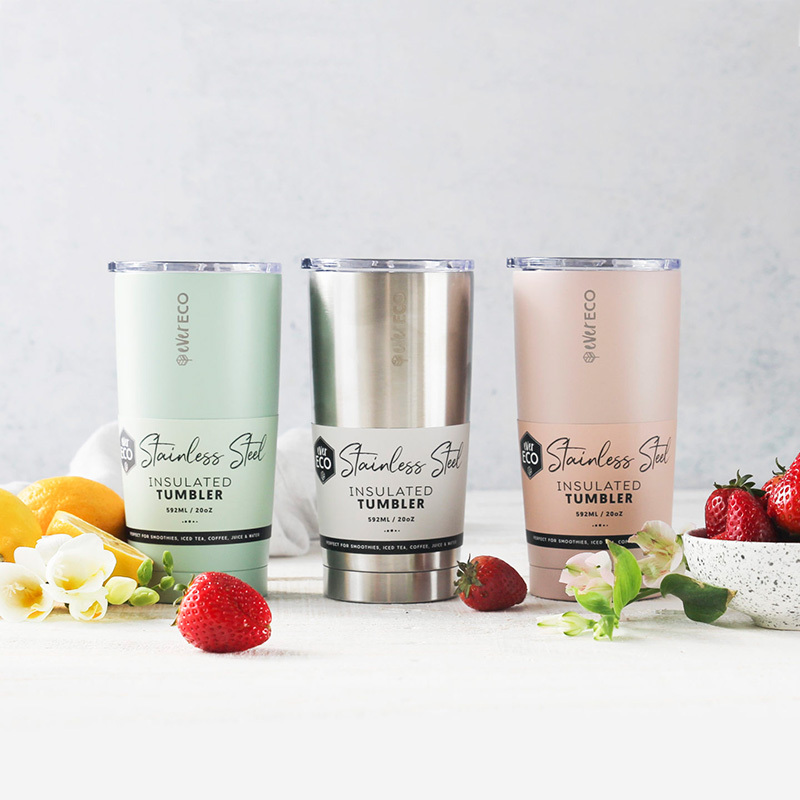 We have searched high and low for as much variety and different features as possible so everyone can choose the smoothie cup that's perfect for their needs. Here's an in-depth run down on what's on offer. This was the first addition to our store in this category, so it's only fair that we go first. 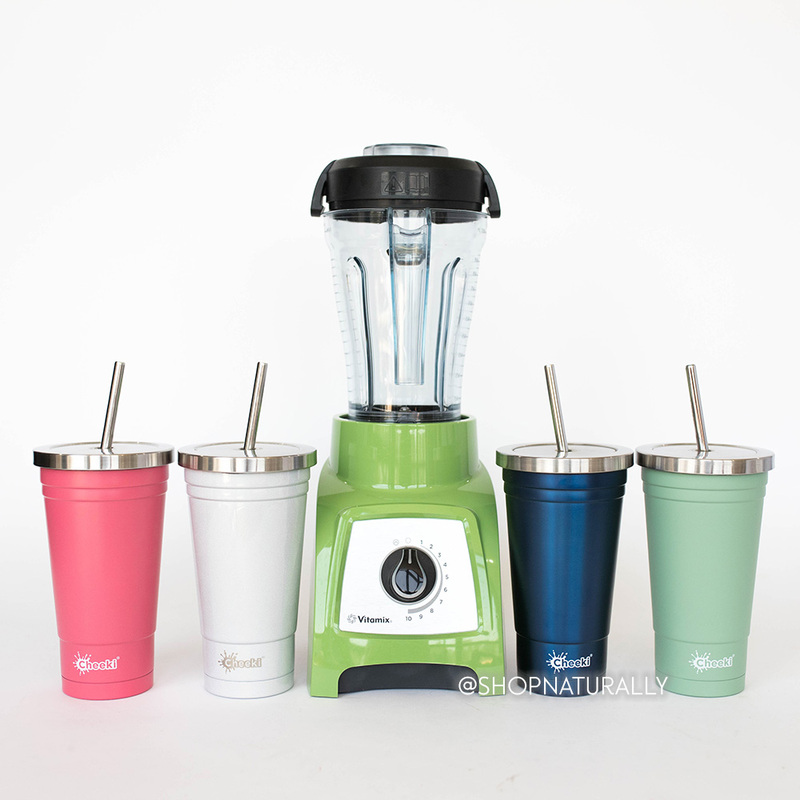 With a 500ml capacity, it will fit most regular sized smoothies and juices from most smoothie bars. The large sizes are hard to cater for in a reusable cup. There's some plastic underneath the lid, but once filled you remain upright, so there's never any plastic touching your smoothie, it's just stainless steel from the inside of the cup and the stainless steel straw. If you like to sip and take forever to drink your smoothie, this is for you. It keeps you chilled for ample opportunity to be the eternal sipper. This is actually designed to be a shaker for protein powders, but we've renamed it for the only real Leakproof option in store. It's a 500ml glass tumbler with a leakproof bpa free plastic lid that firmly clips down in to place, including the piece of the lid that covers the drinking spout. The drinking hole is a really good size, around that of a single use water bottle, perhaps just a bit wider. There's really no need at all for a straw, but you want to put a straw in, any size will fit with ample room to spare. Visit our Reusable Straws to find stainess steel, bamboo and silicone options. The big standout for the BIGGIE from Stojo is that it's collapsible. For every person that says "I don't have room to carry around a reusable smoothie cup", whammo, no excuses! 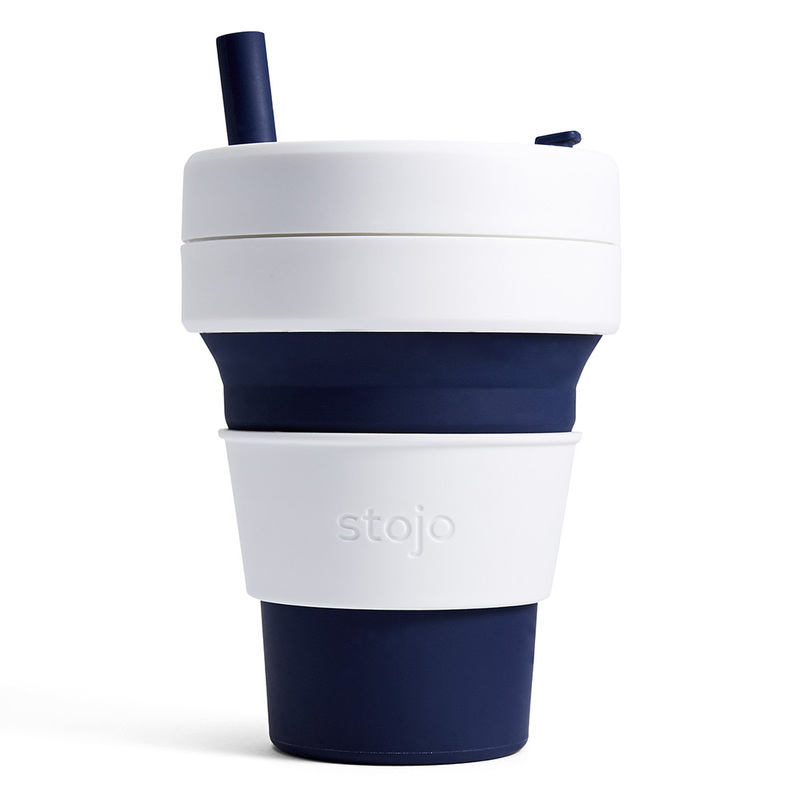 The Stojo Biggie is actually a 16oz coffee cup at heart. The hole to drink from in the cafe cap style lid is round and fits any straw up to 9.5mm in diameter very nicely. They also make a smaller 12oz version with no straw, but feel free to add your own. To collapse down, you remove the white heat band, make sure the lid is in the open position (straw removed) and then just push down on the lid in one quick movement. Pop the white heat band in to the bottom of the collapsed cup and you're good to go. 470ml capacity in a variety of different colours. While originally designed to be used as a cup for drinks at festivals, picnics and the like, the bpa free plastic lid has been designed with a slide opening to expose a hole large enough to take any of our straws up to 9.5mm. In fact, it's the Ever Eco Australia Brand that make a range of our straws as well. They're just a bit larger than the rest, but not quite large enough to take the biggest size from Boost Juice (which is 600ml capacity). A smaller version of the offering that we have at the top of the page from Cheeki, at 450ml capacity, they're perfectly sized for the kids. 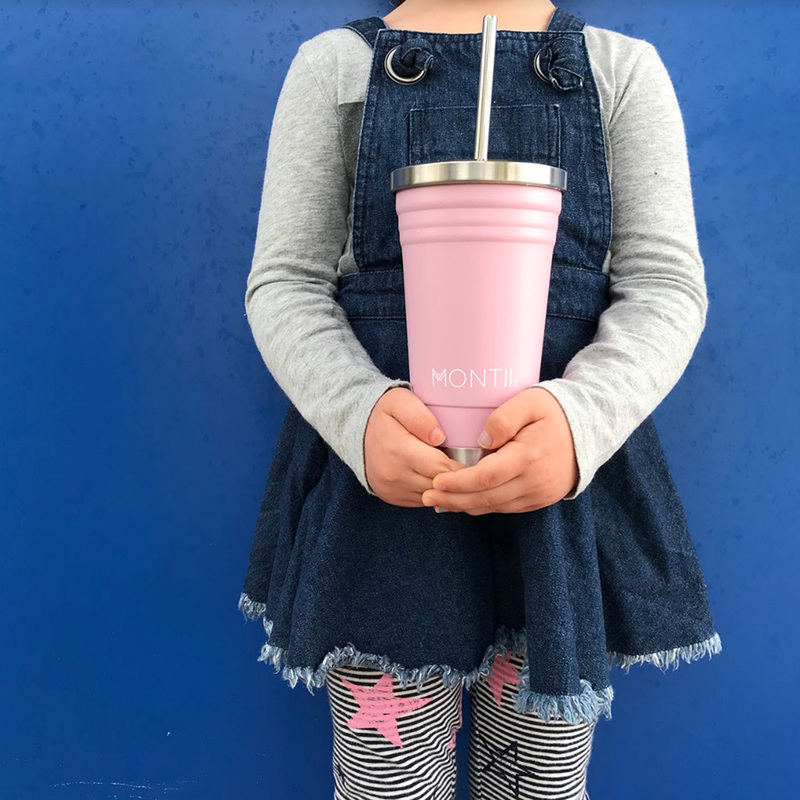 Depending on the age, we actually recommend you don't use the stainless steel straw provided with this one for younger kids. Instead, Montiico have a set of silicone straws that are much better suited. Lightweight, budget friendly, the eCup is made from bamboo fibres, a material that uses very few natural resources and very little water to produce. 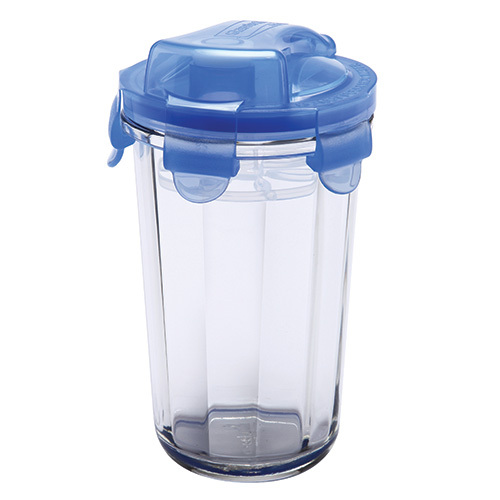 This lid is sturdy and screws in to place with a silicone seal to stop leakage. The hole where the straw lives is not sealed so please keep me upright once filled. Products made from bamboo fibres are a little fragile. Think somewhere between glass and plastic. Be mindful not to throw it around. At 500ml capacity it's a good size too.